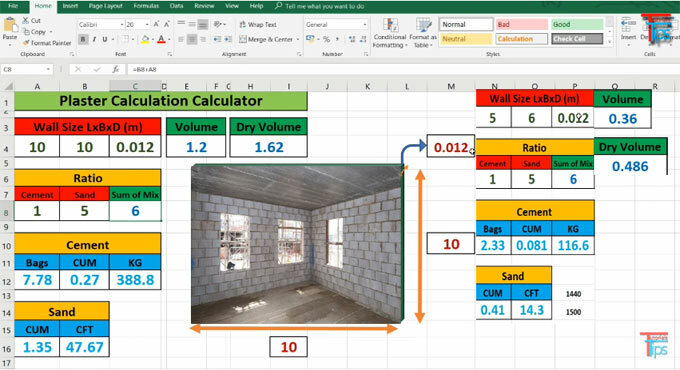 In this construction video tutorial, you will learn how to work out the quantities of mortar for plastering with the use of excel based plaster calculation calculator. Before going to calculation process, we should know the definition of mortar and plaster. Mortar belongs to a paste that is formed by adding water to a mix of fine aggregates like sand and building material. Plaster means a lean mortar that is formed for certain application of arranging a supportive covering. It offers binding force or cohesion among the structural units. It functions as a medium for allocating the forces all through the structure consistently. It provides extra strength and resistance for entering rain and other such weathering agencies. In stone or brick masonry, it fills up void joints; a thin liquid mortar that is applied for such purposes is known as grout. It is used for pointing or plastering to the structure. In first row, there will be wall size (length x breadth x depth) in meter as well as volume and dry volume. In second row, there will be ratios of cement and sand as well as sum of mix. In third row, there will be quantities of cement in bags, cubic meter and kg. In fourth row, there will be quantities of sand in cubic meter and cft. To learn the detail calculation process, go through the following video tutorial.